At Shehan, we’re more than pools—we’re about beautiful experiences. We pride ourselves in creating a complete backyard experience that seamlessly integrates your landscape and pool. Blending form and function, we offer custom stone works that not only enhance your swimming pool landscape, but also increase your enjoyment of the space. Sure, you love your lush green grass, trees, and other landscaping elements surrounding your pool. But what about the hardscaping? Are you limiting yourself to concrete or wood pool decking options? Could you imagine how amazing it would be to have a stone waterfall or wall enveloping your pool? Don’t wish for it—create it! 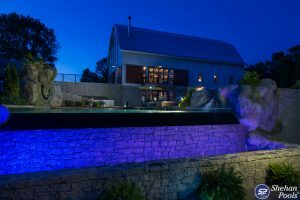 Specializing in custom stone works and masonry, Shehan has literally built a reputation for excellence from the ground up in Kentucky, West Virginia, Indiana, Ohio and beyond. It’s time to discover the boost of enjoyment (and home value!) you’ll get when we transform your space with custom stone works. No matter what budget you’re working with, we have pool decking options and stone hardscaping features to make the most of it. Contact us today at 859-371-9193 to see what we can do.